Our clients built their beautiful home in Nicholls 15 years ago and as their extended family is growing with grandchildren they wanted to remodel their home to use the living space more efficiently by creating a more open and user friendly home. Before approaching Build Professional, our client’s living area consisted of a separate formal lounge, formal dining room, kitchen and family room. They explained that the formal lounge and dining room were areas of the house that were never utilised and that they were wasted space when they were in need of a more open plan to suit their lifestyle. In keeping with modern times, our clients wanted to remove the segregation of these areas to accommodate a large open and light filled kitchen, meals and family room area. Our clients engaged the Build Professional team to design a concept for them which met their brief and lifestyle requirements. The design included removing all the internal walls of the lounge, dining and kitchen to create a large open and light filled space that flowed seamlessly. A new kitchen and walk in pantry was incorporated and re-positioned to work harmoniously with the new flow of the open living areas however, being ever so careful of the enormous structural considerations supporting the upper floor. Arguably, one of the most trying components of this remodel was how to remedy issues with the existing hardwood flooring. Some clever design thoughts and working closely with the clients and joiners we were able to process a solution that exudes style and sophistication when you enter this home. The outcome is beautiful, the home now comprises a large modern open living area which flows and functions with ease and boasts a stunning and timeless kitchen that exudes class and distinction. The design, execution and attention to detail of this remodel impressed the clients and they are now thoroughly enjoying their new kitchen and living areas of their desirable family home. 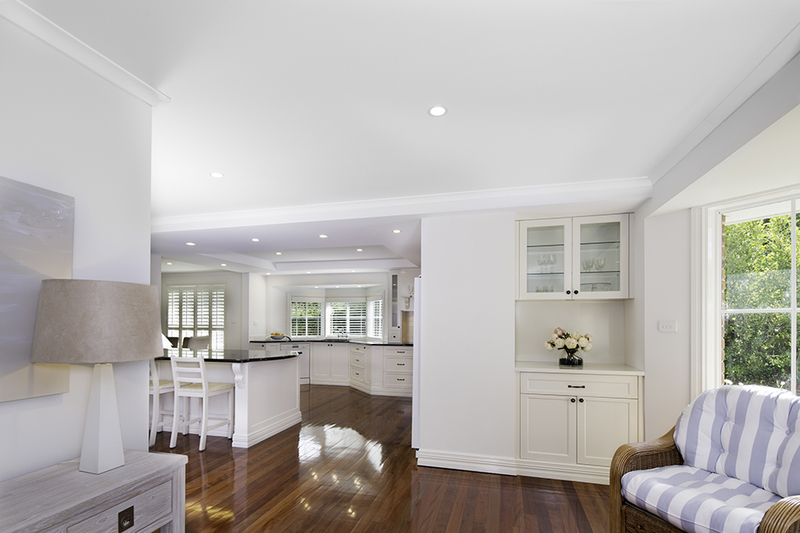 Our clients are fastidious and proud home owners and they are thrilled with the end result. The team at Build Professional were proud to work and meet our client’s high standard in delivering a professional and quality outcome for their beautiful home.